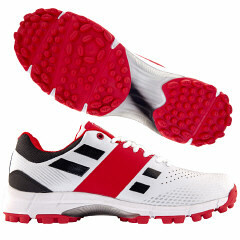 - High Grade PU Upper: Lightweight honeycomb PU with breathable ventilation in key areas. - Powerband: Lightweight overlay support band for improved stability. - GPlus LP Outsole: Low profile XTRA DURA + rubber outsole - ideal for all surfaces including nets and indoor. - Torsional Midfoot System: Provides bridged midfoot support and forefoot flexibility.